Sarracenia flava just popped its top! |Sundews Etc. I've been waiting on my Sarracenia to open their first new pitchers of the season for a while now. I think part of what caused them to take so long was shipping stress, and part of it was probably that I buried the rhizome too deeply, since at the time I was potting these plants up I didn't know anything at all. I wish I had seen this post by the Pitcher Plantation, since it's an excellent description of how to go about potting/repotting Sarracenia. In fact, the whole three post series about building a bog garden has been great. 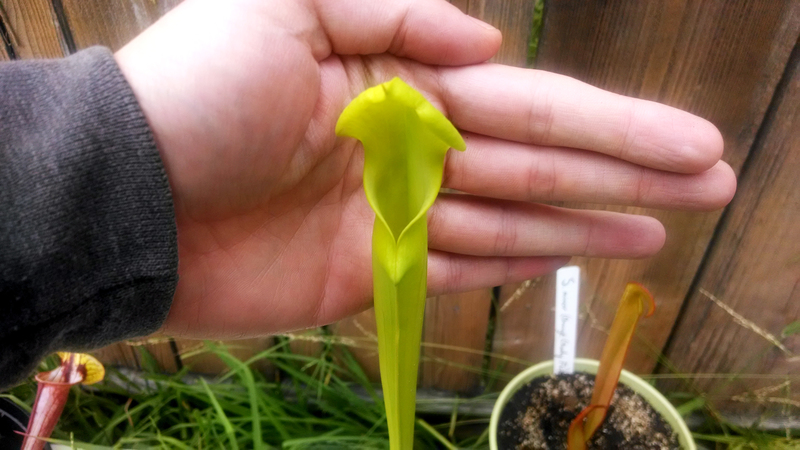 If you're interested in Sarracenia at all, you should be reading that blog! My plants first broke dormancy about 5 weeks ago, and I've been watching them in anticipation ever since. Today I spotted something from my back door. 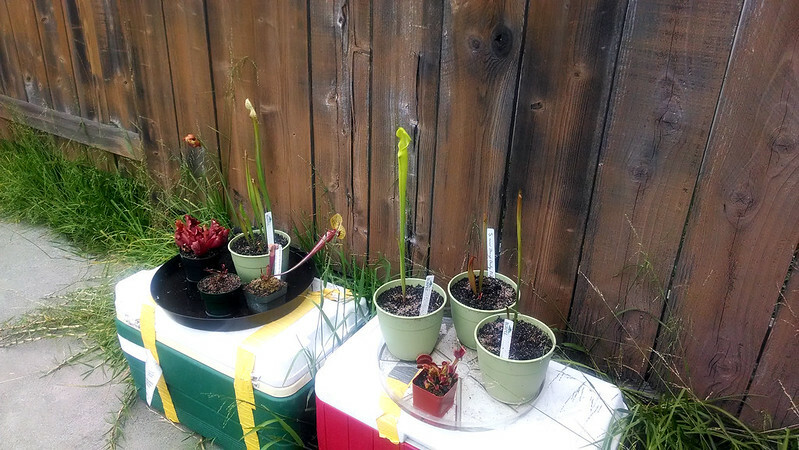 Sarracenia growing outdoors, along with a VFT and a sad D. capensis. That's Sarracenia flava, winning the race against S. leucophylla to be the first pitcher open this season. It's a striking chartreuse color, and is almost 2 feet tall. A vivid, creamy new pitcher on S. flava, first of the season. I'll be looking for S. leucophylla "Titan" to open next, then probably S. minor (Orange County, FL), and then S. alata "Heavy Veins" (Stone County, MS). My S. leucophylla (Hurricane Creek) that I won at the BACPS auction hasn't started pitchering yet – it's still got a flower hanging out and that's all. I hope it gets into gear soon. It's time to catch some bugs.